Our beloved teacher, aka Guru, has passed on. With sorrow in our hearts at saying goodbye, there is also the joy of knowing he is free from the suffering of the body, and of his reunion with Love beyond the physical. 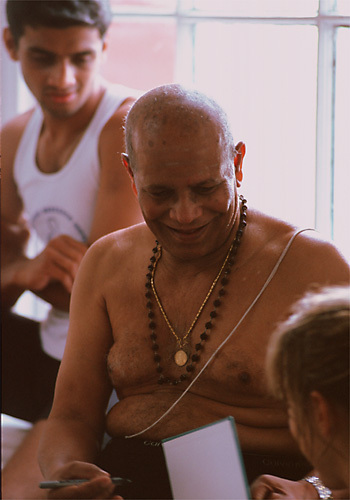 I first met Pattabhi Jois in 1986 during his summer intensive at the White Lotus Foundation in Santa Barbara. At that time John Friend and I were “buddies” and as John was participating in the intensive, he invited me to visit for the weekend. I was living in LA and teaching at Samata International, therefore it was an easy trip. Since Guruji was virtually unknown, many of his early students were there and it was fun to be involved. I was immersed in Viniyoga training at that time and I did not reconnect with Guruji’s practice until 1988 on Maui, Hawaii. From then on it was the love of Ashtanga that kept me moving between Encinitas, Hawaii, and Mysore, India. Although I was not one of his “very” close students I was so fortunate to be with him at the time when he was strong and virile, and when there were only 12 students on the mat at the old Mysore Shala. I have always been amazed at his capacity for being there when you needed him, and for his memory of who you were and where you were in your practice. He was indeed one of a kind! In 1995 when I was in Mysore and attended Guruji’s birthday celebration in July, I was heavy of heart from a broken romance. Going through a punk rock phase (you know the 90’s grunge scene!) I was practicing very fast and furious and everyone thought I was nuts, except Guruji. He loved me and would say “Briskly Do, Briskly Do”. He was allowing for my need to work off my angst. The last time I saw him was in 2005 on the Encinitas phase of his tour. By then there were 100’s of students and he was getting the allocade and wealth that he deserved. He still had the memory of “Annie” aka me, as the “bad lady” that I am, and he would give me that little squeeze from behind to show his love and approval. 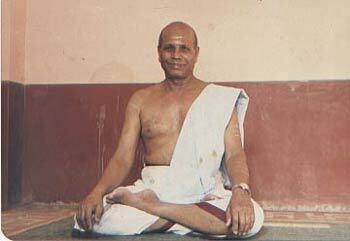 Many things have been said and written about Pattabhi Jois, much of it true, some of it opinion. One thing is for certain, there will never be another to totally fill his sandals! Guruji, you will always be in our hearts! Yes, I’ll always be able to say that I once had the opportunity to literally practice at his feet, thanks to you. I think it was during his 2005 visit. We zipped in a little late for practice and low and behold, you spied a few spots that were left open right up front. What a beautiful experience, Anne. Thanks for sharing it. Among your many other gifts, you also have the gift of writing. 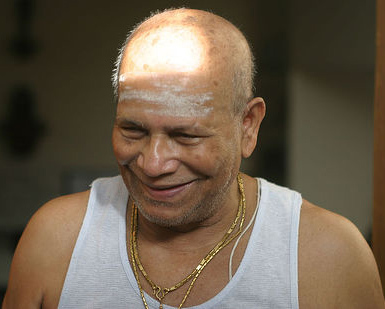 I have never studied, nor have I read much about, Pattabhi Jois, but your story provides personal insight into the great teacher (and person) he was. He has definitely influenced your life in many positive ways. No wonder you are such a wonderful teacher and friend!